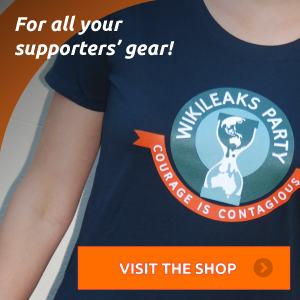 Personal information provided to the WikiLeaks Party and information collected through this website will only be used by the WikiLeaks Party for the purposes of registering the party with the Australian Electoral Commission (AEC) or for official party purposes including communications to members on party news and activities or contacting volunteer supporters. 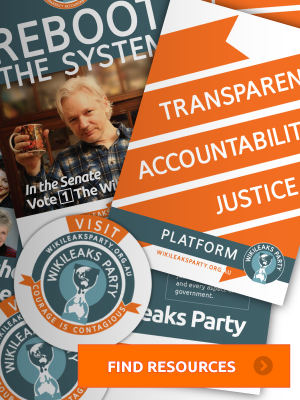 Personal information provided to the WikiLeaks Party and information collected through this website is transmitted in encrypted form and stored offline. It will not be disclosed to any third party outside the WikiLeaks Party other than the AEC unless by express permission of the individual concerned or by court order. Our systems collect non-identifying information relating to website usage by visitors to the website via cookies. This information includes time, date, IP address, browser and other general website usage information. This information will not be used to identify any individual unless by court order served on our ISP. Whilst all reasonable measures have been taken to ensure your safety and privacy, users are advised that there are inherent risks in transmitting information across the internet. View our comment policy here.